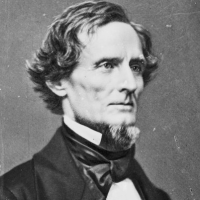 Jefferson Finis Davis was a United States soldier and statesman, and was the President of the Confederate States of America during the entire Civil War which was fought from 1861 to 1865. He took personal charge of the Confederate war plans but was unable to find a strategy to defeat the larger, more powerful and better organized Union. 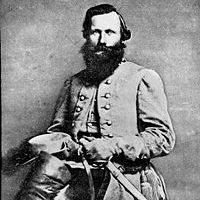 James Ewell Brown "Jeb" Stuart was a U.S. Army officer from Virginia and a Confederate States Army general during the American Civil War. He was known to his friends as "Jeb", from the initials of his given names. Stuart was a cavalry commander known for his mastery of reconnaissance and the use of cavalry in support of offensive operations. 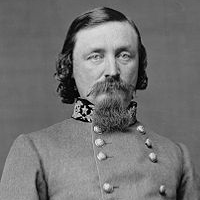 George Edward Pickett was a career United States Army officer who became a general in the Confederate States Army during the American Civil War. He is best remembered for his participation in the futile and bloody assault at the Battle of Gettysburg that bears his name, Pickett's Charge. 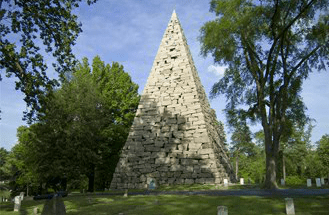 Hollywood's ninety foot granite pyramid, completed in 1869, is a monument to 18,000 Confederate enlisted men buried nearby. They went into battle for what seemed then a noble cause of protecting their homes from northern aggression. When the pyramid was erected, Southerners still called the Civil War "The Lost Cause". Now we know that the cause was not a lost one. These men's lives, along with those of their northern counterparts, were given to forge a single and better nation. Their blood, shed in battle, gave birth to a new America, one that in another century would restore and protect freedom around the world.